In Elementary School (wow, I’m dating myself) I remember a poem by Robert Fulghum titled “All I Really Need to Know I Learned in Kindergarten.” In this poem, Fulghum explains that to get to where he was, it was not upon “the graduate school mountain” but from the social life-lessons learned in kindergarten. This poem spawned tons of parody posters, self-help books, and had multiple references in popular media. 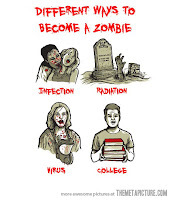 And now, in its honor, I present you “All I Really Need to Know about Student Affairs I Learned from Zombie Movies”. 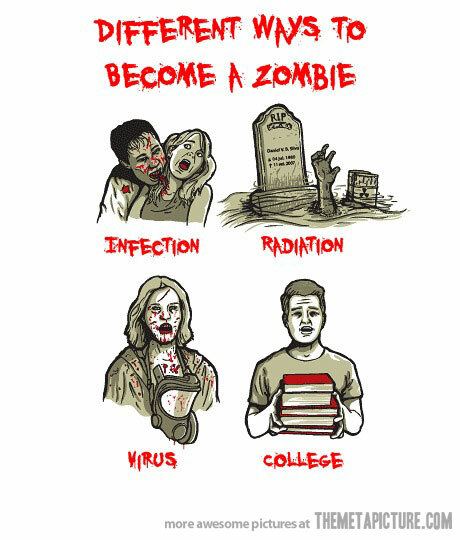 To survive the Student Affairs apocalypse, you need to be prepared. Know of your resources, utilize your human capital effectively and efficiently, and focus at the task at hand. The destruction of the social mores around you can cause you to panic. By preparing an adequate Student Affairs safety net, you will be able to venture out into the dangerous wasteland. Survivors know how to handle their business, don’t get me wrong. But the second you venture out into the dangerous world alone you will not come out alive. The same can be said for those who fall in with the wrong crowd. Surround yourself with numbskulls and you are bound to sink. Maintain that fine balance of self-improvement while surrounding yourself with highly skilled professionals and you won’t become one of the walking dead. Whether you are the persevering zombie walking across the bottom of a lake to reach your prey on the other side, or that new professional trying to make your mark before landing a mid-level position, you can’t let yourself stagnate. Constantly keep moving, checking your surroundings all the while. Seek out new opportunities, don’t look a gift-horse in the mouth, and don’t look back. There is a term used for those who stop to smell the roses. Lunch. Fire is bad. Its destructive powers not only cause millions of dollars in damage to university buildings each year, but it leaves lasting scars to all it touches. Yes it can be used as a zombie repellant, but any time you play with fire, you are bound to get burned. However, continue to allow that fire to burn from within. Let the passions that enticed you into the profession continue to engulf you as you move throughout your career, for when they are extinguished you become a shell of your former self. A decaying, vacant shell. In Student Affairs, we have a limited budget. Our resources are limited, and they become scarcer as our institutions are forced to relocate money traditionally given to our area. The greatest survivors are those that can take a little and make a masterpiece from it. Whether it is a fashionably crafted weapon or a solid community, ingenuity means progress. As a professional, you must always stay up-to-date with current events. Whether it be national legislation which changes the field or current events which impact your students, staying current is as vital in the professional realm as it is during a national emergency. Just make sure you are utilizing the appropriate resources. Follow your national organizations journals, examine reputable news sources, and utilize social media. Just remember with all of the aforementioned resources to not believe everything without doing your own research. It can save your life! The myth of a work-life balance can become closer to a reality with a well fortified home. Whether you still live in a residence hall or you have a tiny apartment in the worst part of town, making your new locale home can help alleviate the stress of your daily life. Stockpile books, video games, hobbies, and lots of food. Don’t forget to take some time to go “off the grid” so that you do not feel constantly attached to your work email. Regardless of the circumstances outside, you can always make your home the secluded get away that everyone needs. The first to fail are the ones who don’t believe in themselves. They doubt, they make excuses, and in their self-destruction they bring those around them down with them. You can never give up in this field, as now more than ever it needs professionals like you. Believe in yourself, believe in those around you, and continue to try and change the status quo. Just remember to follow these eight steps. Failure to do so can result in catastrophic consequences.